On Sunday, participants made outings to a nearby interpretive center, hikes, and a cool swim in the John Day River. Many simply enjoyed staying at their campsite, hanging out in the breezy shade while chatting, reading, and sketching. Dinner featured a locavore’s delights: culinary offerings all sourced from central Oregon: smoked meat, fresh salmon, grilled veggies, ripe tomatoes, fruit pies, and local wine, beer, and cider. Sunday night, Tyler Nordgren ’91, a professor of astronomy and physics at University of Redlands and author of Sun Moon Earth: The History of Solar Eclipses From Omens of Doom to Einstein and Exoplanets, spoke to the group about what to expect. 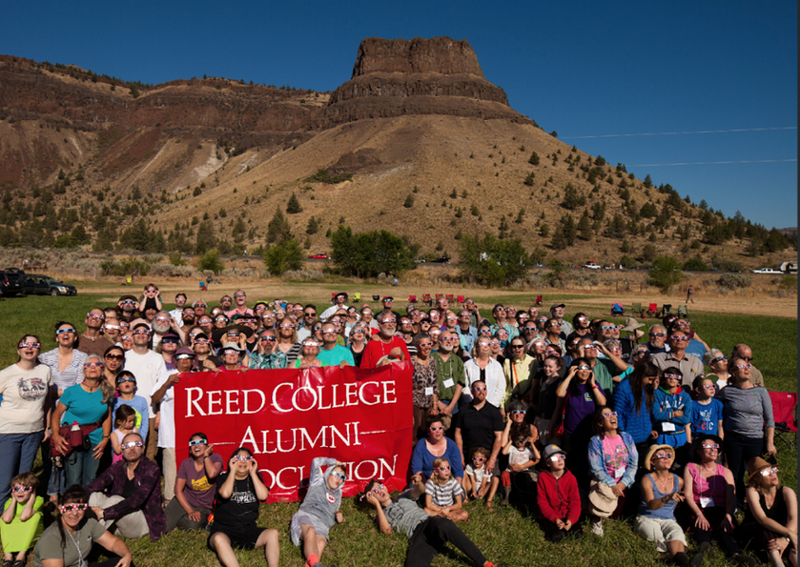 He encouraged Reedies to get out of their heads and experience the eclipse with all of their senses. Tyler said that while an eclipse touches one in a deep and personal way, he thinks it’s best to have that experience surrounded by loved ones. For more about upcoming alumni trips—including a voyage to Antartica—check out our page for Alumni Travel Study.